BELCHER, Captain Edward. Narrative of a Voyage Round the World, Performed by Her Majesty's Ship Sulpher, during the Years 1836-1842. Including Details of the Naval Operations in China, from Dec 1840 to Nov. 1841. London: Henry Colburn , 1843. First edition. Two octavo volumes (9 1/4 x 5 13/16 inches; 235 x 150 mm). xxii [i.e. xxxviii], , 387, [1, blank], [16, ads]; vi, , 324, , 325-474 pp. Complete with all nineteen engraved plates, hand-colored with gum arabic. Each color plate with a protective tissue guard. Also with numerous black and white vignette and three folding maps in the rear pocket of volume I. 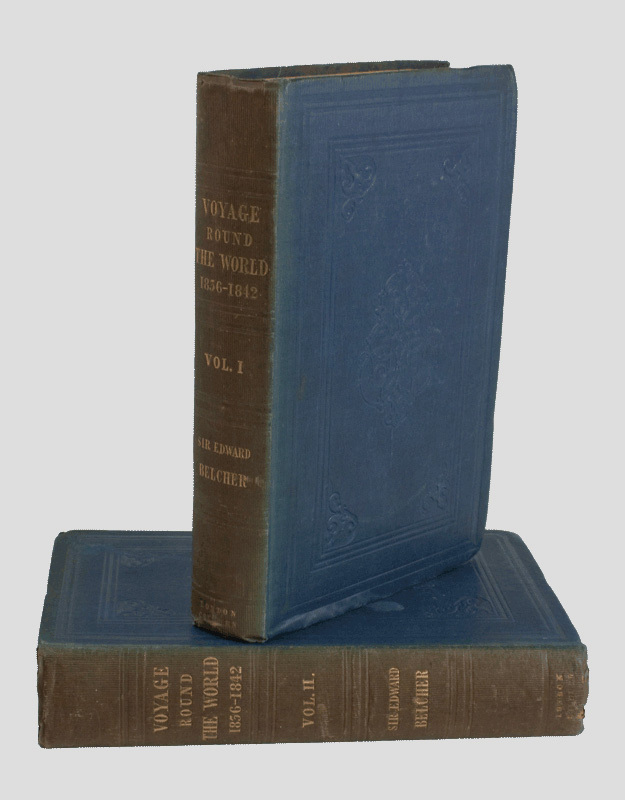 Publisher's blue-green blind-stamped cloth, spine lettered in gilt. Uncut. Spines a bit sunned. Some glue residue along edges of pastedowns. Maps each with an old perforated library stamp, mostly in the margins, and a couple of fold line tears, but generally very good. No other library markings in books. Previous owner's bookplate on front pastedown of each volume. Inner hinges a bit cracked. An excellent copy of this classic of naval exploration. The purpose of this expedition was to explore and survey the Pacific Coast of North and South America, from Valapraiso, Chile to Alaska. Among the harbors and ports visited and surveyed were Port Etches, in King William's Sound, Point Riou and Port Mulgrave, Kodiak Island, Sitka, San Francisco, Monterey, the Columbia River, Bodega (the Russian possession near San Francisco), Santa Barbara, San Pedro, San Juan and San Diego. At Sitka , the officers were greeted by the Russian governor, Captain Koupreanoff. At San Francisco, they took a month long journey in open boats up the Sacramento River. Their ship, the Sulphur, also stopped at the Hawaiian Islands, the Marquessas, Society and Tonga Islands, New Hebrides, Solomon Islands, New Guinea, Sumatra and Malacca. 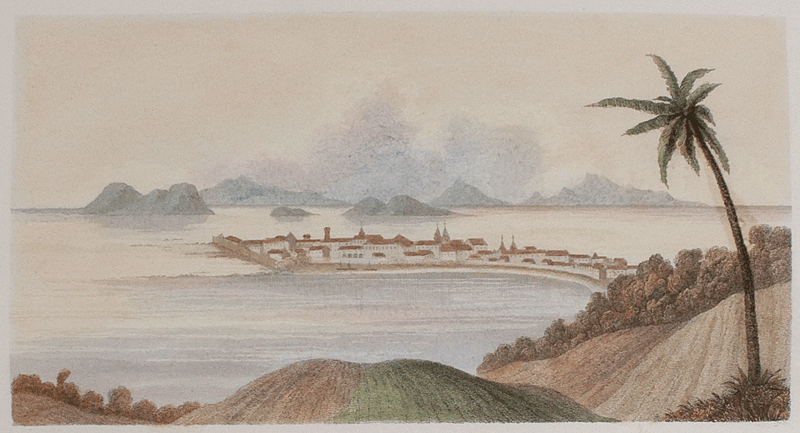 When they reached Singapore in 1840, Belcher was sent to China, where war had broken out, and was there actively involved in military campaigns on the Canton River. Cordier, Sinica, 2370. Cowan, p.15. Ferguson, Australia, 3564. Hill p. 20. Howes B318. Lada-Mocarski 117. Sabin 4390.